Rack Press has just published my latest collection of poems, The Water Steps, which collects together work from three previous books and much new work. Many of the poems have been published in journals, including London Magazine, Poetry Review, The Rialto, The Times Literary Supplement. It is 1792 and a group of English gentlemen is recruiting settlers for a new world. Anti-slavers, they foresee the shining vision of a free colony in Africa where all races and classes can live together in harmony. At first, all seems well. More than a hundred men, women and children sail from London on board the Pharaoh. They are bound for Muranda, an island off the west coast of Africa that seems to be ideal: uninhabited, fertile, well watered. For a leader, they have a merchant, Sir George Whitcroft; a gallant seaman, Captain Coupland, to sail their ship; Dr Owen to treat their ills; the Reverend Tolchard to guide their spiritual lives; and Caspar Jeavons, a young aristocratic poet, to record their exploits. When they land, Muranda seems a paradise. Fruit hangs from the trees, the waters swarm with fish, the local king is friendly. Some begin to work. Others prefer to laze and swim, to drink and dance at night. But then the tropical rains begin and beat relentlessly down. Fever strikes arbitrarily and cruelly. William Palmer's latest novel is a remarkable portrayal of men and women and their experiences and emotions, from violence and terror to tenderness and love, in their brave new world. THE DEVIL IS WHITE is published by Jonathan Cape. ...full of sharp twitches on the psychological thread, The Devil is White is at its considerable best in a handful of highly symbolic set-pieces: Caspar seeking out a brothel in Tenerife, and discovering that his purchase has no tongue; an elephant hunt which ends in the slaughter of the prime bull and Tabellun's revenge; Hood, the resourceful carpenter, lost in the forest and spending the night with only the apes for company. Cramming preparations, voyage, settlement and crisis into a bare 300 pages was never going to be easy... None of this, though, should detract from Palmer's immense talent as a novelist, and my only real complaint about him is that he doesn't write nearly enough. 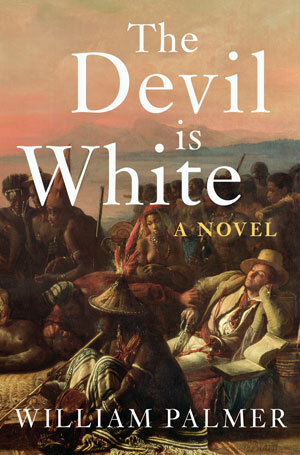 ...Palmer has demonstrated his admirable skills as a novelist in previous books and The Devil Is White is a poignant study of ideals unravelling in the face of reality. "if you don't know Palmer's other books it should be clear enough here that he is also a novelist. Moments come complete with back stories and future plot lines, charged with dramatic irony so that in 'The Bomb in the Cafe' ... the male protagonist seems all the more vulnerable because he is described as "brisk, handsome, young". 'The Death of Likeness' is a lovely example of the powerful way Palmer's narrative control strengthens his poems... 'The Lost Music' encapsulates the bittersweet sensations on display in this collection: "A midnight feeling at midday;/a whisky afternoon".